Is the cost of delivery included? Yes, a free delivery service is included to all parts of England and Wales although there may be a small carriage charge for some areas of Scotland, although this is not always implemented - it all depends on the supplier. A delivery charge is usually implemented for Isles off of the mainland and also Ireland. All orders over the cost of £49.95 (inclusive of VAT - our website shows VAT inclusive prices) qualify for free delivery, items under this value will incur a £5.95 delivery charge. How will we know when the product is to be delivered? The website explains the lead time against each of the products and also a cut off time for items on next day delivery. On other items the courier will generally call you or the manufacturer delivering on our behalf. Yes, as you will see as you browse through the website many products are available in different colour finishes. The colour to be chosen is generally taken off of an RAL colour chart, let us know what colour you require on the desired product. Colour options always take longer for delivery (generally 3-4 weeks), and colour options also carry a plussage charge of around 25% on top of the white price. Why can I not buy colour options online? Although alot of our suppliers offer colour options we do not offer buy online option for colours.This is simply because everybodies monitor is set to a different resolution. We prefer to send out a metal swatch free of charge, that way everybody can be certain on what they will be getting when the product is delivered. What important things should I tell you at the time of enquiring/ordering? We will need to know the manufacturer, type, size, colour, and whether any additional products are required e.g. electric heating element or radiator valves. Please also tell us if there is diffucult access to your property, this will allow us to advise the courier/manufacturer of this point. All goods need to be signed for so if you are aware of the product being delivered on a certain day please make arrangements. When will I be sent an invoice? An invoice will be sent immediately after the order has been taken. If you need to contact us with regard to your order please state the order number and we can assist with any query. How do I convert BTU to KW (Kilowatts) ? This is really simple, we advertise in BTU due to alot of the manufacuturers brochures doing the same as we do, if you want to convert it is really easy. e.g 3412 btu = 1KW, therefore e.g 2000 btu/h ÷ 3412 = 0.586 watts (i.e. 586 watts). Do our radiators come complete with radiator valves? Due to so many permutations on how your radiator is to be fitted no radiator valves are supplied with our radiators. We have choices online for angled, straight and corner radiator valves, we also offer these in a manual or thermostatic option. The only radiators on the website which come complete with radiator valves is the Zeb and Cultivator, we also have some radiators online where there is a promotion and radiator valves are offered as standard, this will be clearly stated on the relevant product. What is the differerence between manual and thermostatic radiator valves? Manual radiator valves have no thermostatic control. The radiator temperature is controlled through the thermostat on your central heating system and the manual valve is only used to turn the radiator on and off. The maximum flow of hot water out of the radiator is controlled by adjusting the lockshield valve on the radiator outlet as for thermostatic valves. All of our manual radiator valves are sold as a pair which contains a wheelhead and lockshield valve. Thermostatic radiator valves control the temperature of the radiator via a built-in sensor, which automatically opens and closes the flow of water into the radiator, maintaining the room at the pre-set temperature. A manual valve can only control the temperature of the radiator regardless of the room temperature. Thermostatic radiator valves are recommended by the Energy Saving Trust and under the governments efficient heating advice. All of our thermostatic radiator valves are sold as a pair which contains a thermostatic valve and lockshield valve. 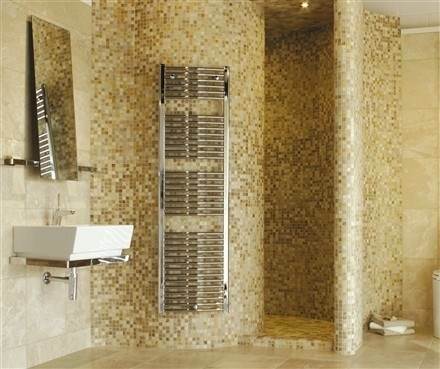 Why do chrome towel rails give out less heat than a white towel rail? The efficiency of the exchange of heat from a towel warmer to the air will vary depending on the make up of the towel warmers surface. 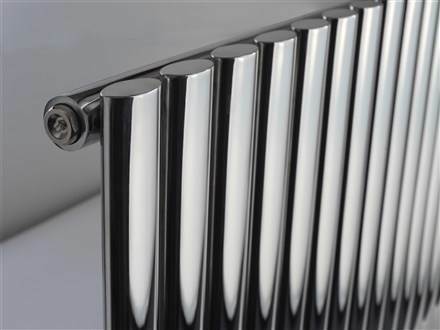 Shiny finishes, such as chrome, do not emit heat as efficiently as coloured or matt paint finishes. Chrome plating creates an extra layer of metal that insulates the towel warmer and further reduces the heat output; this is approximately 20% less than a white/painted towel warmer. Is there anything more I should know? Some of the manufacturers are based in Europe - please note that in August Italy generally closes down their manufacturing plants for upto a month, and Belgium generally for two weeks. Yes, we can offer radiator valves and on some bathroom towel warmers an additional electric element to make your purchase dual fuel which can be purchased to ensure that you have warm towels all year round without having the heating on. We can even supply bespoke radiators to your requirements. We try to add as many new products to the website as possible so if there is something you can not find please call us on the numbers shown above or click the 'Contact Us' page to send us an email. Yes, VAT is included in all products. No, we supply the products to you and recommend you get a reputable installer in your area who is fully qualified to install your purchase. In the unlikely event of the product coming damaged or faulty after installation what would happen? A collection note will be raised for the damaged product and a new one will be delivered as soon as possible, and again, Warm Rooms or the manufacturer will call you at least 24hrs prior to arrange a suitable delivery time. In the unusually unlikely event of your product becoming faulty after installation we will deliver the replacement product and collect the faulty product when you have done the changeover. Please note Warm Rooms will not contribute to the cost of an installer revisiting your property to change the product. Can you send me a manufacturers brochure? Yes, please contact us obviously stating your full name, address and postal code and Warm Rooms will send you the relevant brochure.